The Old Court Theatre is located opposite HMP Chelmsford. It is a fifteen minute walk from Chelmsford train station which is on the mainline to London Liverpool Street, a ten minute walk from Chelmsford town centre and is easily accessible from the major roads in Chelmsford and the A12. There is some limited car parking outside the Old Court Theatre on Springfield Road after 7pm. There is some additional parking available at the MOT garage next to the Oddfellows Arms, a few minutes walk down Springfield Road. Alternatively, there is pay-and-display parking available at the Riverside Ice & Leisure Centre on Victoria Road, a five minute walk from the theatre. 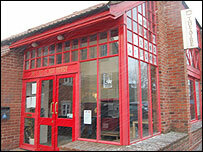 Old Court Theatre Box Office – For the collection of pre-booked tickets and purchasing of ‘on the night’ tickets only. Old Court Theatre Bar – The bar is located on the 1st floor of the theatre and serves a wide range of alcoholic and non-alcoholic drinks. It is possible to pre-order interval drinks at the bar, and the bar is open until 11pm after every show for you to enjoy a post-show drink. Note that the bar is only open on performance nights. Old Court Coffee Bar – On the ground floor, the Old Court Coffee Bar is able to serve you tea, coffee and a wide range of snacks before the show and during the interval. It is possible to pre-order you bar drinks at the coffee bar. Toilet Facilities – The Old Court Theatre has full toilet facilities including a disabled level access toilet. Access – The theatre foyer, auditorium, toilet facilities and coffee bar are located on one level and are fully accessible for wheelchair users. We regret that the bar does not have level access; however, it is possible to ask for drinks to be brought down to the foyer and interval drinks can be pre-ordered at the coffee bar. £50 Notes: Please note that CTW does not accept £50 notes. Anybody presenting a £50 note will not be allowed to purchase tickets or goods with that note. Please note that the Old Court Theatre is not available for public hire.